The calm before the Jeselnik. With his Quaalude strut, runway model looks, and deadpan delivery as deliberate as a surgeon’s scalpel, the Alice Cooper of comedy eviscerates a San Francisco audience. 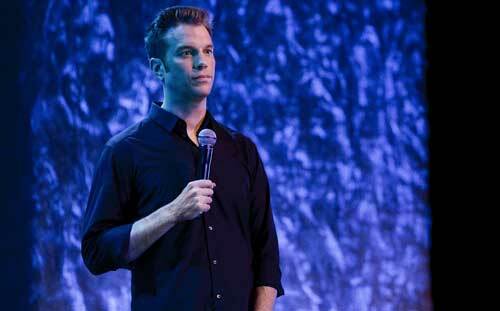 When Anthony Jeselnik kills, he really kills. This standup comedian, comedy writer (LATE NIGHT WITH JIMMY FALLON), producer (THE JESELNIK OFFENSIVE), regular roaster on Comedy Central, and plonker of the luscious Amy Schumer, is the hero America needs, but not the one it deserves right now. He just doesn’t care. As Jeselnik tells us toward the end of his scathing set, “Do I look like I care about my career?” Which allows him the power to say whatever he wants, unworried about offending anyone. While offending everyone. He’s pretty damn fearless. However, how long can any principled person ply their trade in this unprincipled, cowardly, brain-clouded environment called America. Many, if not all, comedians have been stultified by the networks that hire them, especially outspoken, dangerous comedians that slice into the spine of taboo subjects and bring forth gold (Richard Pryor comes to mind), and Jeselnik is no exception, as he relates how Comedy Central threatened to fire him if he did not delete his tweet about the Boston Marathon bombing on the day it occurred (“Today there are some lines that should not be crossed. Especially the finish line”). That issue would ultimately resolve in Jeselnik losing his show (THE JESELNIK OFFENSIVE) at the end of its second season in 2013. He’s aired material that has been banned, he’s had death threats, his family have received death threats… And the whole country of New Zealand is after him for making light of a New Zealand shark attack victim. Still, this is his second stand-up special (after 2013’s CALIGULA), so he must be doing something right. Or at least lucrative for venal corporate swine. There is a deeper layer of onion to Jeselnik’s callous exterior. “People say to me, ‘Anthony, what’s funny about Aurora? What’s funny about the Boston Marathon? What’s funny about your grandmother’s funeral?’ Nothing. Nothing is funny about those things. [Pause] That’s where *I* come in.” Jeselnik truly feels a compulsion, a calling: “I got a job to do. How can I make people laugh today?” An avocation: “I didn’t get into comedy for the money or fame. I know that sounds wrong, because I’m dripping with both.” There’s something deeper here than just trolling to get attention. He’s digging at the roots of a tree that has been over-watered for so long over other saplings, it has grown to sky-darkening proportions – that tree of “civilization,” of social mores; that tree with the tacit demarcations that separate us from the beasts, from tribal superstitions; that tree whose branches fan out into “accepted modes of behavior” and political correctness and fear of alien cultures. There’s so much to unpack. Will you be staying long? Jeselnik explains why he MUST go against the grain, in one of his most truthful bits. Whereas he feels compelled to address tragedy with originality and with the intent to make people laugh, he cannot stand that empty wish to victims and their families, “My thoughts and prayers…” (Another perfunctory rite that has grown into society like a cancer. Thank you for calling this empty practice out for what it is, Anthony!) “You know what that’s worth? Fucken nothing! Less than nothing! You’re not giving any time or money or even your compassion. All you are doing is saying, ‘Don’t forget about ME today’… They’re like a wedding photographer who only takes selfies.” It can be argued that even Jeselnik – with his biting takes on whatever has made the nation weep – is also craving attention; his point is: at least he’s doing it in an original way that takes some effort on his part. His final piece is made more powerful by cutting to black as soon as he arrives at the left-turn punch – none of that worn empty sentiment “Thanks, you’ve been a great audience. Good night.” If he doesn’t truly mean it, you won’t hear it from him. Like Alice Cooper, who scared and offended and crossed lines when he sang about Dead Babies and Only Women Bleed and I Love The Dead (even though Cooper’s most “disturbing” songs were truly political statements or merely tongue-in-cheek), Jeselnik’s brutal style brings him lots of grief from the general populace. As with Cooper, Jeselnik’s content can be construed as commentary on the human condition, rather than simple digs for attention. But as he notes in this show – times change: “You can’t make fun of THIS right now. A couple of years later, it’s something else. Which is why it’s so hypocritical.” Today, though Alice Cooper is still touring with the “outrageous” show he pioneered in 1976 – which features beheadings, blood, snakes and – dead babies – Alice is a rock icon, a national treasure, doted upon by fans, media and promoters. Is this Jeselnik’s trajectory as well? Will he one day become as acceptable and respectable as the man who sang about orgies in hell, neurotoxic spider venom and necrophilia? I’ll bet ten dead babies on it. Premiered on Oct 2015, on Netflix. The “Banned Episode” that turned a whole country against Jeselnik.